The Sony Walkman NWZ-Z1060 Android player PMP pairs impressive audio with 4.3 inches of stunning display, but can it take on the popular iPod touch? Retaining the iconic Walkman branding of past generations, the Sony's lastest personal music player features little in common with the cassette and CD players of yore, instead the Sony Walkman NWZ-Z1060 Android MP3 player lines up as a largely impressive content rich device that plays host to video capabilities as strong as the audio offerings. Whilst most modern PMPs have to fight for consumers' attentions against the same two rivals, Apple's iPod collection and the onslaught of widely adopted MP3 packing smartphones, the Sony Walkman NWZ-Z1060 sets itself apart, forming a niche that sees the oversized 4.3-inch device playing host to a selection of nifty interface features that pull away from the throng of standard Android fare. With the Walkman's biggest rival, the Apple iPod Touch, feature a stunning and sturdy construction, the NWZ-Z1060 has a lot to live up to. Impressively, the device goes a long way to holding its own on the style front with the largely plastic construct offering an aesthetic and feel that exceeds expectations. As comfortable in the hand as it is in the pocket, Sony's latest high-end PMP lines up at a minimalist 11.1mm thick and a reassuring 156 grams in weight with the well-constructed device proving impressively solid when put under extreme amounts pressure with little flex or unnerving creeks and groans. With a minimalist collection of physical buttons well placed around the sleek, ergonomic design, the NWZ-Z1060's connectivity options are bolstered by the integrated HMDI connection port which allows for HD content to be ferried to and from the device. Sadly, the Walkman's connectivity line-up is not all sunshine and lollipops, with Sony taking the strange option to omit the near standard microUSB charger in favour of a cumbersome WM-PORT option that offers few benefits but means travelling with the device will mean yet another cable needs to be added to your bag. 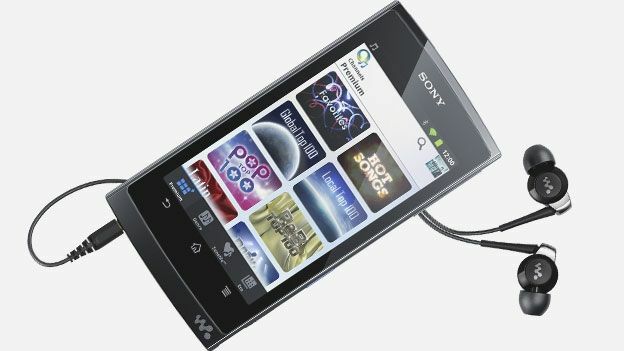 Far more than your standard MP3 player, the Sony Walkman NWZ-Z1060 is an all-round entertainment powerhouse with the device's Android 2.3 Gingerbread innards helping ensure users are never more than a few touchscreen taps of the stunning 4.3-inch LED display from filling the handset with a bevy of app based content. Running along smoothly thanks to a 1GHz NVIDIA Tegra 2 processor, the trio of standard Android touch buttons feature as Sony builds on Google's software with its own custom UI that expands on the overused OS with a selection of intuitive features that help enhance the user experience. A prime example of this is highlighted following a tap of the intuitive 'W' button with a pop-up music widget overlaying on open applications, and even on locked screens, allowing users to skip tracks, alter volume controls and change playback options. What's more, instead of simply tapping through a selection of menus, users can navigate through tracks with a selection of intuitive finger swipes, left-to-right to skip forward, right-to-left to go back. Although unlike the likes of the latest iPod Touch and the Samsung Galaxy S2 mimicking Samsung Galaxy S Wi-Fi 4.2, the NWZ-Z1060 does not play host to its own inbuilt camera, a feature seemingly on every consumer's wish list for all tech items, the Walkman machine does feature a skeletal selection of image editing tools with users able to crop, resize and rotate their own downloaded shots. With a G-sensor gyroscope enhancing the PMP's gaming credentials and the xLoud speaker offering strong audio playback, 32GB worth of internal storage ensures the Sony device holds its own in the highly competitive market. It provides ample space for users to fill the unit not only with the musical centrepiece, but video content and a full selection of Android based apps, games and services, all available through the newly transformed Google Play Store. Helping set the NWZ-Z1060 apart from the throng of competitors, the device's 4.3-inch LED backlit TFT display provides a stunning visual offering with the beautiful 480 x 800p image resolution continuing to impress well beyond that first eye popping use. Equally strong across both stills image viewing and video playback, the multitouch display is pin sharp with users able to enjoy movies and TV show viewing with little concern of motion blur, muted colours or other quality depleting issues affect a number of its closest competitors. Useful for more than purely entertainment purposes, the Walkman's enjoyable screen helps enhance the overall user experience of the NWZ-Z1060 with smooth, speedy and highly responsive transitions making the somewhat pricey device a joy to use. Unlike a number of PMPs that have put so much focus on all the added bell and whistles that the basics are all but forgotten, the Sony Z-series Walkman maintains strong audio abilities via both the integrated Clear Audio xLoud speaker or when partnering with a pair of headphones. Despite its impressive output abilities that see little rattle or distortion accompanying the deep, well rounded sounds, the NWZ-Z1060's inbuilt speak is placed in a very awkward place. Lining up in the centre of the PMP's rear panel, setting the device down on a surface during periods of playback see the audio quality rapidly diminish with muffled, incomprehensible tones replacing the previously strong output. Annoyingly, the only ways to combat this basic issue is to either keep the device in hand at all times or alternatively lay it down face first, a move that leaves its stunning 4.3-inch screen liable to damage and video viewing an impossibility. With audio playback that well outstrips that found on Sony's latest range of own branded smartphones including the likes of the Sony Xperia P, the Walkman's plus points continue when connecting either the boxed, silicon tipped in-ear headphones or a stronger, more high-end pair. Although the boxed buds provide a broad, comprehensive set of sounds, the 3.5mm audio jack, despite being well placed on the device's base, proves unusually stiff with considerable force needed to insert or remove the audio enablers. Although playback times are impressive, the NWZ-Z1060's integrated battery is far from the quickest to charge with a full 14 hours worth of playback requiring the device to be connected to the mains via its continually irksome WM-PORT for a hearty 5 hours. Far exceeding expectation on all fronts, the Sony Walkman NWZ-Z1060 is an impressive PMP that does a lot to set itself apart from the recent bevy of Android filled devices. With a stunning 4.3-inch display and a UI that does a lot to detract from the Google -branded base, Sony's latest top of the line Walkman is taking the company back to its musical high notes. As impressive as the Walkman is, it is hard to get away from its lofty price point. Setting wannabe owners back a hefty £299, Sony has priced the latest Z-series device well above the similarly specced iPods, a move that is sure to lose it a number of potential buyers.